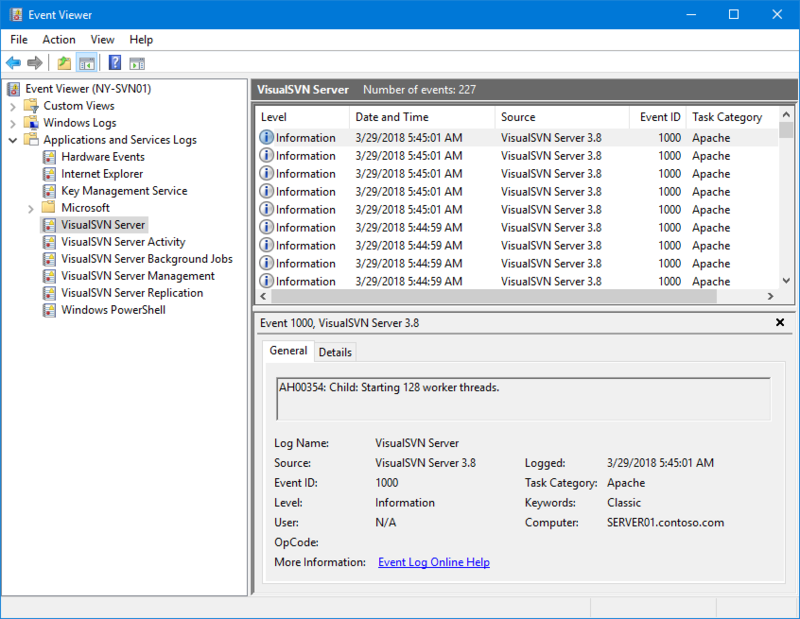 VisualSVN Server uses the Windows Event Log to store its logging information. Log messages that relate to various subsystems of VisualSVN Server are stored in separate Event Logs. This article provides a summary of the Event Logs and shows how to find and export log messages using the Windows Event Viewer. Event Logs available in VisualSVN Server. How to export the VisualSVN Server event log. Retrieving logs for an interrupted installation. VisualSVN Server event log. It is the main VisualSVN Server event log that contains log messages related to core server subsystems. The log contains critical errors and warnings related to the VisualSVN Server HTTP service and VisualSVN Server Manager console. VisualSVN Server Activity event log. The log contains Access and Operational logging events of read and write operations performed by Subversion end users. The log is active in VisualSVN Server Enterprise Edition when you use the Access and Operational Logging feature. VisualSVN Server Management event log. The log contains audit events that help keep track of user access permission changes made via the VisualSVN Server Manager console, the VisualSVN Repository Configurator tool or using the VisualSVN Server PowerShell cmdlets. Such events are logged only when the server is configured to use Windows Authentication. VisualSVN Server Replication event log. The log contains events related to the VisualSVN Distributed Repository File System (VDFS) service. The log is active when you use the Multisite Repository Replication feature. VisualSVN Server Background Jobs event log. The log contains events related to the VisualSVN Background Jobs service that is responsible for the repository backup and maintenance tasks. For more information about the repository backup and verification, read the articles KB106: Getting Started with Backup and Restore and KB115: Getting started with repository verification jobs. Expand the Applications and Services Logs category. Right-click the VisualSVN Server or another event log and select Save All Events As. Tip You can export the events selectively instead of exporting the whole log. When viewing the log in the Event Viewer, select the events you want to export and select the Save Selected Events context menu command. VisualSVN Server installer always creates the main VisualSVN Server event log. However, the log will be absent if the first installation fails with the "Service 'VisualSVN Server' failed to start" error and rolls back. Start the VisualSVN Server installer. Follow the steps of the setup wizard and start the installation. Do not close the error message dialog when you receive the error "Service 'VisualSVN Server' failed to start". Follow the steps specified in the section How to export the VisualSVN Server event log to examine and export the log messages.